The Sri Lanka Army said today that it would prove that Commander of its 200-strong contingent assigned to the UN peacekeeping force in Mali Lt. Col. Kalana Amunupure, was not guilty of any Human Rights abuses in the last stages of the war. Military Spokesman Brigadier Sumith Atapattu said however that it would comply with the UN request and take steps to recall Lt. Col. Amunupure, when an official request was received. “We have been informed that there was a request to recall the commander who is leading the UN peacekeeping contingent in Mali,” he said. “But it was only a verbal request. We will recall the Commander according to the formalities following an official request. If the UN does not want him there, we have to recall him. “However, we do not agree with the allegation. He has not done anything wrong. He has not committed any war crime. We will appeal and send him back,” Brigadier Atapattu said. He said this was the second UN peacekeeping mission of Lt. Col. Amunupure. The Brigadier said the first 200-strong Combat Convoy Company (CCC) contingent led by Lt. Col. Kalana Amunupure was scheduled to return upon completion of their one-year tenure in Mali this December. He said 20 officers and 240 other rankers commanded by Lieutenant Colonel K.L.I. Karunanayake with Major P.G.J Suriyasena as his Second-in-Command, would undertake responsibilities in Mali as replacement for the first CCC. Last week, the United Nations asked the Sri Lankan Government to immediately recall the commander of the Sri Lankan UN peacekeeping force in Mali following its review of his Human Rights records. UN Spokesman Stephane Dujarric announced that the request for Lt. Col. Amunupure to leave Mali was made “based on recently received information.” He gave no details. 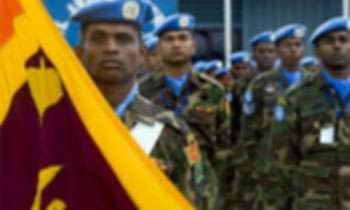 A total of 19,000 members of the Sri Lanka Army have to-date served in UN peacekeeping missions either as Combat Troops, Military Observers (156), Staff Officers or as Assistants to Staff Officers in several parts of the world. Your suggestion is good but works only in a civilized country. The war is now over for 9 years and not a single war criminal has been convicted and not a single victim has been compensated so far. The international community should increase its pressure on Sri Lanka. When army investigate itself the come out smelling like a rose. Srilankan army can be brutal and they had a free reign against the JVP. in the late 80s. This site has got infested with LTTE sympathisers crawling like worms all over hell bent on tarnishing the image of the Army. It is very clear judging by the thumbs down votes for even reasonable comments. If what ur saying is correct, then the best decision the Army needs to take is to allow an independent investigation and be happy after that bcos it will show what u claim is the truth. Be bold and go for it. If not, then you have a lot to hide. @laki - Ha, ha, ha. Laki you have been spot on target. See the number of thumbs downs you have got. This is the consequence of co sponsoring US accusations and facilitating UN resolution 30/1 in Geneva (2015). Well done the UN. Now you have got Sri Lanka to answer to the international community. Better still, the army. Well done. Keep human rights violators out. Our army and all our politicians are famous for rejecting any charges against them. SL should call back it's entire peace keeping force . There is no need to send our personnel. They have better things to do at home. Our forces are being reticuled in the world public. A disgrace to SL. This is the repercussions of State criminality that is going to stay for decades. Yes it is a damn disgrace but only if we were to identify and punish the perpetrators it would have bought a lot of honor to Sri Lanka. UN has become a kangaroo court. Was the officer given a chance to defend himself against the charges? How come former UK Prime Minister Tony Blair who is directly responsible for the carnage created by invading Iraq on a false pretext of chemical weapons had got a UN job as a special envoy to middle east? Hypocrisy at its best? Why don't you pull out whole team ? saying you do not agree with UN's verdict on ARMY BOSS? Of course soldiers who have committed Human Rights violations have no place in the UN peace keeping contingents. But to me it looks like Sri Lankan Army is being targeted character-wise by some foreign country.Privately there are shocking allegations against the Indian Army but no one asks any questions about them. Maithri says, they are no offender ONLY in SRILANKA not in the world at LARGE. If the Commander in questioned had not done anything wrong to violate human rights,you have to prove that he is innocent and don't just let it go like that. Of course, it's always better to comply first as per their written request and then do the needful to clear the Commander's name. SL Armed forces one of the most disciplined in the whole world!!! That's why those galant forces managed to wipe-out most ruthless terrorist outfit from SL soil !!! Since then SL forces were scrutinized by the whole WEST!! Why!! If terrorism and the threat is reduced, then most western countries stand to loose Billions of dollars !!! In the west couple of countries wants terrorism as a going concern!! Yeah, its a mega billion dollar business to them!!! Untoucheble - Maithri says. ONLY IN SRI LANKA and not in the WORLD. In any war both parties commit abuses on Humans, animals, property. In fact on everything! So what's the big deal? British army committed crimes against humanity world over and in Iraq too!! Several inquiries done by British Govt however, no punishment for perpetrators!!?? And then American forces committing atrocities worldover as we speak!! But no UN or any agency looking into these crimes against Humanity!! What kind of HYPOCRISY is This!!??? don't do crimes.punishment follow you for life. The independent investigation is the only Way to prevent this kind of incidents.